Finn is the third best investigator in the game. There, I said it! Superceded by only Rex Murphy and Ursula Downs, Finn is an exemplary investigator and an incredible member of any investigation team. This is my standalone-ready build to prove him as such. Finn combines Rogue's two strengths - evading and investigating. These abilities work quite well in tandem, which means he can temporarily deal with an enemy while continuing to pick up clues before leaving the enemy in the dust. This deck leans into the Cluevering side of Finn and away from the support/evasion side. Whereas an evasion Finn might have Peter Sylvestre, Trench Coat, Manual Dexterity, etc, this build relies on Streetwise to evade. You likely won't go out of your way to evade too often, so this should be sufficient. I published this list to go alongside my article on the 4 roles of investigators. Mandatory: The core of the deck is Dr. Milan Christopher + Lola Santiago. Investigating gives you resources, and Lola spends those resources. This is obviously very powerful, but managing resources is still tricky. 2x Lola + 1x Charisma is 9xp. Lockpicks is perhaps the strongest investigation tool, and allows wonderful Double or Nothing plays with Deduction and Perception. Lola also makes your picks dial up to 10! Flashlight stays in as well - this is full-on Cluever, so you'll leave the combat to someone else, thus giving us use of both hands for investigation tools. The Flashlight works really well with Double or Nothing and Lola Santiago, so I think it is well worth the slot. Flexible: Streetwise is a very strong permanent, but I don't find myself using it all too often. Your money is mostly feeding Lola every turn, so you don't want to put more than you have to into Streetwise. It is still a very nice emergency button. Most of the Skills - Deduction, Perception, Courage, and Double or Nothing - feed directly into your role as Cluever. DoN is good for getting a second clue, and works well with the combos mentioned above. These can be tweaked as you see fit. Flexible: Because we're essentially building around Lola, resource management is crucial. There's a list of cards to choose from, and I'll go through my choices below, but know that you can mix and match from this list to match your playstyle. There's nothing wrong with taking all of the lvl 0 options on this list, but I felt Lone Wolf was the weakest. Because you don't have a way to eliminate enemies, you need babysitting from a Fighter, so I figure it will be hard to get that LW trigger. Watch This isn't astounding either because you'll only ever use it for its icon, and in order ensure you get the money back from it you will likely pump with Streetwise. Burglary deserves special mention because, once set up, your Intellect is a cool 6, and with Milan you gain 4 resources. This is a best-case for Burgles, and even then i'm not totally sold, but I figured it would be worth a shot. We have 4xp for economy, and I've chosen Hot Streak over Pickpocketing. This might be ill-advised if you think you'll be evading much at all, and that might be determined by party make-up. I don't think it would be hard to get up to 5 resources for HS2 with Milan in play. Mandatory: Finn's 1 makes him really vulnerable to Frozen in Fear, hence the Logical Reasoning. If you're playing Dunwich or Zealot, you should switch to 2x LR and 1x Deduction. Other treacheries will be taken on the chin or handed off with "You handle this one!". Flexible: Elusive is always welcome and might be the strongest event. Slip Away buys you an extra turn at locations with many clues (this could be a 2x if you like). Think on Your Feet is nice for the extra movement but could be dropped for something else. All of these are flex spots, and you can include any of your favorite rogue tools here. I really like this! I feel like a lot of the cards and abilities are so so good that it's easy to think of them as the last word in cluttering, but you've laid out so nicely how that isn't the case. I'm especially interested in decks at the moment, because as a little challenge for myself, I've been trying to play through as much of the published material as I can with a party consisting of Skids, Jenny, Sefina and Finn. After a bit of trial and error, I came to a pretty similar place with Finn :) The only thing I wonder about is Winging It. It's slow and can't be combined with Lockpicks, but you can use it several times over and when there are so few cards that get more than one clue/action in Finn's card pool, I feel like there could be a place for one you can use repeatedly. Thank-you for a very interesting and enjoyable read ! @bee123 Thanks so much! Yeah, I hadn't considered Winging It, but it could totally find a home in here. What do you think - maybe in lieu of Deduction? With the static boosts from your allies, landing Winging It should be easy peezy! Its reusability definitely warrants a look at it. `@PureFlight Yes, I think if it's taking the place of any card, it's got to be Deduction. I think there are cases where Deduction would be better, but I think Winging It really does have a lot to recommend it even beyond the reusability. -1 shroud has some nice synergy with Double or Nothing, and being played from the discard makes it very resilient to effects that interfere with your hand or deck. For example, it doesn't care about (Return to the) Dunwich Legacy effects that discard cards from the top of your deck. Quick question: when you say Finn is "the third-best investigator in the game", do you mean the third best clue-getter in the game or the third strongest investigator total? Do you have a decent solo Finn list? @wern212 So when I wrote it, I meant third best overall because he can get clues very easily and evade or eliminate enemies using evasion and rogue tricks. But this deck is full-on Cluever and doesn't have much in the way of enemy management. So...maybe this isn't a great example? I did play Minh alongside an unoptimized Finn and it was crazy how much Finn outclassed her. So I really do stand by that statement. With some tweaks this Finn list could be the powerhouse all-rounder that I think he is. The idea here is that it is so incredibly expensive to beat "must-pass" tests that you can't afford to do it consistently, so you simply try to win before those WP tests would make you lose. Evasion is really easy for Finn, so you'll evade the majority of enemies. Waylay kills you a Victory enemy, and your switchblades/.38 can help you in the event that you need to clear doom-toting cultists or otherwise get too bogged down. Your skills have lots of draw, so you hopefully can find what you need consistently. You also stay at a comfortable 13 assets, most of which you only will play one of in a scenario, so that keeps your turns pretty active. If you happen to throw together a similar list and try it out, let me know how it goes! @PureFlightinteresting. I don't necessarily disagree with Finn being high up that list, though I disagree with Ursula? Unless I'm missing something, she's a good investigator, but not like Rex. Wonder if you could tell me why you think Ursula is so good? @wern212First, my opinion of Rex is insanely high. Then there's a big gap to #2. I also think Seekers are pretty bonkers relative to everyone else, so I'd look to a yellow gator next. I'd rank the Ursula, Daisy, Minh, Norman, and I'd put Minh in the top half of all investigators. Ursula's engine is wildly strong, where you can Pathfinder, Fieldwork1, Ursula Investigate, Fieldwork 2, Investigate and get two clues as a single action. Double Pathfinder makes it pretty funny too. Then, she has Seeker's normal color-pie-bending tricks like "I've got a plan!" and Acidic Ichor plus Evasion to handle enemies. And if you go Grotesque Statue she's very consistent. Overall I think Daisy is very good because of her filtered draw and Encyclopedia. I'm picking Ursula over her because Ursula can handle enemies through evasion from turn 1. What are your thoughts on the top 3ish investigators? @PureFlightI agree that Rex is really good. I'm less high on Ursula because I think she's rather vulnerable to enemies. She can get clues pretty reliably but with access to only cards she can't deal with most enemies. I get that the same could be said for Rex, but where Rex can easily get two clues per investigate action without other cards, the same can't be said for Ursula. I want to say "Ashcan" Pete, but I think it should probably be Wendy Adams. I just haven't played Wendy recently and I have played Pete. @wern212 Good points. Wendy especially makes up for her low strength with lots of rogue tricks like Backstab and Sneak Attack. Ashcan is also incredibly strong right out of the gate. @wern212 Ursula's card pool isn't great, but I feel like she has some tricks available to her that no-one else does. The Gold Pocket Watch is a big investment of XP, but it's absolutely game-changing when you get it out especially at higher player counts. And she has access to various seeker tutoring things for it that make it less unreliable. And aside from the solutions and stones and what-have-you, Grotesque Statue and Pnakotic Manuscripts are really good bits of chaos bag manipulation. So, I dunno, maybe the "best after Rex" tier is relative to XP level? @bee123that would make sense. 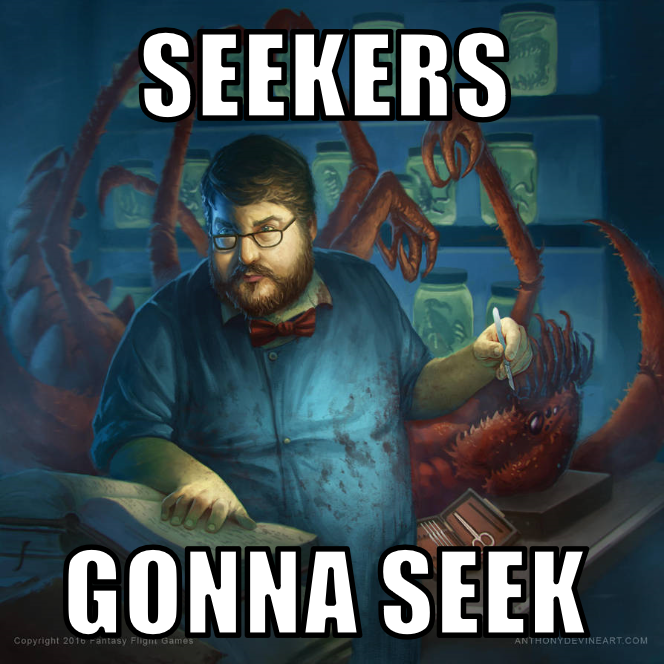 Also, for the record, I do not consider myself an expert on Arkham Horror or even Ursula. It's just that I recently experienced her having a lot of trouble in TFA with enemies. Though, honestly, that might just be TFA. I don't think she's bad either way, but I wouldn't put her above Finn? It's also worth pointing out that I think Finn's flexibility is a big point in his favor. He can go full-on evade and investigation, or he can grab some beefy rogue weapons like Lupara and Chicago Typewriter, even the .41 Derringer is good. But on the other hand, he has weaknesses, like his of 1 and the fact that level 0 weapons are mostly very bad. Point is, if you just want an investigator that has the most impact on the scenario, Ursula could be better. But I like the fact that Finn encourages the player to try things and experiment. Regardless, I think we all agree that both Finn Edwards and Ursula Downs are great investigators. And honestly, what @PureFlight mentioned, after Rex there isn't an easy choice for who is the "best" investigator, because the investigators for this game are almost all really well-designed and fun. @PureFlight Your article about the 4 roles of investigator was nice and well-written, but I was really keen on reading more about the support role and I was kind of displeased that there wasn't a "Tell me more about their strategy" section for them. I must admit that the support role wasn't really an existing role in my mind until I read your article and I really wanted to know more about their game plan and strategy. @matt88Thanks! That's an excellent point, as was probably a bit of an oversight on my part. I'll try to add that into the article in short order here. I'm curious to see if anything in The Circle Undone adds to our pool of support options. @PureFlightYeah, I guess the Circle Undone may add some more interesting options. We 'll wait and see. I was actually really curious about how a Guardian and Seeker can play a support role, while the main job of each is naturally different than being a support.